Doctor Zarbartz needs your help! Separate the polluted liquid in the distillation tower. This is a unique liquid separation puzzle. Your operation is very simple. Just trace with your finger and press ON/OFF button. You can lead liquid with your blocks. Pour blue liquid to a blue tank. Stage will clear when you filled a tank. You can download press kit for reporting this title. 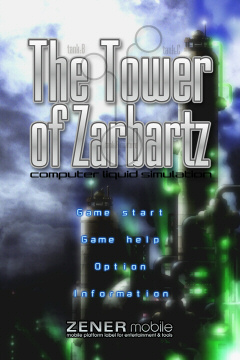 The Tower of Zarbartz was developed as a indie game for NEC PC-9801 computer in 1994. 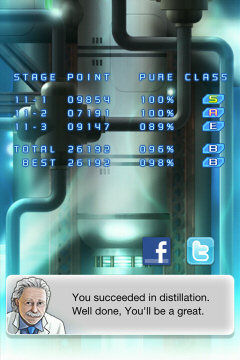 It is the legendary title which produced many distillation maniacs of "distillation puzzle". Then, although the port to a console video game was advanced, development of a game machine was interrupted and was not released. Now, The tower of Zarbartz revived with the newest technology by Team OniKu which obtained high evaluation at the sense of wonder night in 2009. 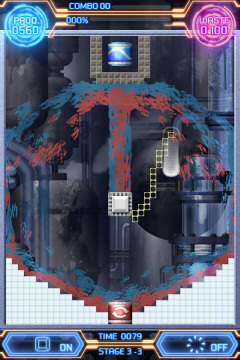 The liquid puzzle game of the new generation that took in touch operation and an beautiful effect is made. Furthermore, the unpublished musical piece by Mr. Shinji Hosoe ( Super Sweep ) was also revived. Team OniKu is a entertainment creation unit that features coincidence of calculation and human interaction. Other Team OniKu works here. Division of Zener Networks Inc.
Entertainment software developper in Tokyo, Japan. 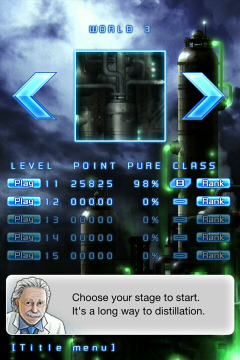 Copyright(c) 2009- ZENER mobile All Right Reserved.